A handsome iPad 2 case made of top grade cowhide leather, this Bear Motion folio-style cover protects the iPad from scratches and bumps. The material is high quality and resists scratches. The cover folds back to form a stand for watching media and typing. It also supports sleep mode and awakens the iPad when it’s opened. 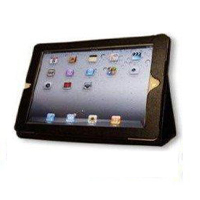 Essentially, all the convenient features you expect from a quality iPad case are here, and the construction is quite effective and durable. Aesthetically it’s somewhat plain, but it holds the iPad securely and offers great all-around protection. It’s available for $34.99.